Roccone lies on the spur of a rock where it has been situated for more than a century in the middle of the nature reserve Pigelleto at the foot of Mount Amiata in the province of Siena. 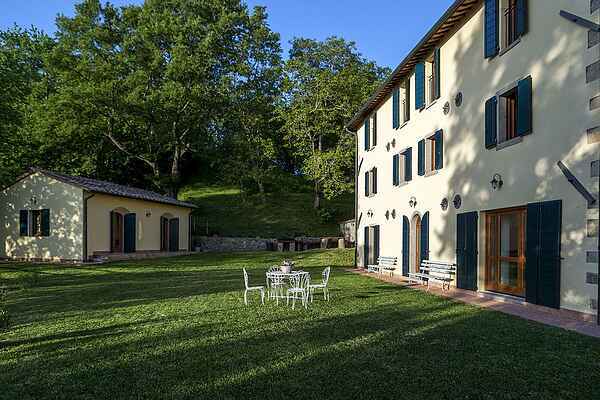 Roccone was recently renovated and is surrounded by woods and fields, crossed by footpaths. The summer is nice and cool, because it is situated at 800 meters above sea level. Because of the nature surrounding this house, it adjusts atmosphere intensively with each season. It is therefore the ideal place for a complete immersion in the forest to get rid of the stress and to restore the natural balance of the body. Because of the large rooms, the house is very suitable for large groups while this does not affect everyone's personal space. The property, over a hectare big, is completely fenced and has Wii-fi connection and satellite TV conference room. We are only a few dozen kilometers from the main tourist destinations in Tuscany (Val'd'Orcia, Siena, Pienza and Montepulciano, Maremma, Etruscan Pitigliano Sovana and Sorao, Tyrrhenian coast) of Lazio (Lake Bolsena, Viterbo) and Umbria ( Orvieto, Lake Trasimeno Perugia. In a few minutes you can reach the springs of Bagni Vignoni, Bagni San Filippo, Saturnia, San Casciano dei Bathrooms, Petriolo. For those interested, we can arrange a private cook and transfers in car/bus.